"Three musicians banded together as The Razorbacks with one common goal in mind - to make sure this good ole Rock'n'roll music gets into the mainstream and the people's ears. Several years ago The Razorbacks signed a deal with Fury Records of the U.K. The vast possibilities in the European market for this style of music has been overwhelming for many years, thus making the decision to sign with a European label that primarily deals with Rockabilly an easy one. The Razorbacks are led by Kenny Duda, who formed the band in 1983. Kenny has been playing guitar since grade school. This shows in his versatile ability to go back and forth in styles from the 'twanging' of Duane Eddy to the raw drive of Brian Setzer. Kenny is more comfortable on the stage performing than most people are in their own living rooms! 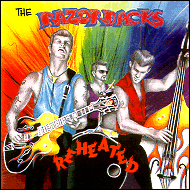 The band started out as a pub or small club band doing primarily covers and remakes of old Rockabilly tunes. It quickly evolved and Kenny started to concentrate on original songs. Kenny attributes their incredibly large repertoire to this since in the early days the band relied on so many cover songs. The band would sometimes have to play four or five hours at a club. Rob 'Bobcat' Bundy slaps the double bass. He has been with them for over ten years. Rob became a permanent member right after the 'Cruisin' Down' LP came out. Rob, being the youngest member, came in with much less live experience. He was playing in a few small local bands when they found him. The Razorbacks were already touring extensively with several world trips under their belts at the time. The pressure to perform and fit in with the seasoned Razorbacks would not be an easy job, but Bobcat has now become one of the most recognized slap bass players in the business. Mark Swartley joined the band several years ago after seeing The Razorbacks perform throughout the Philadelphia area. Mark hailed from Philadelphia where he had been doing some drum session, studio and teaching work. He had the itch to get back on the road with some serious wild men. When the position became available, Mark was there to fill the space he was destined to have. After all these years the three ring circus was now complete. The success of the band has put them on stage with many fine performers such as Carl Perkins, Bo Diddley, Fats Domino, Robert Gordon and the Stray Cats on many occasions. They have even had many well known entertainers not commonly associated with Rockabilly checking out their exhilarating performances such as the legendary Bruce Springsteen.